The 2018 World Rally Championship title battle took another dramatic twist on Saturday morning in Turkey as Sebastien Ogier hit trouble just one stage after title rival Thierry Neuville’s retirement. Ogier had moved into a 25-second rally lead when Neuville sustained broken left-front suspension on leg two’s opener, eventually forcing the Hyundai driver to retire. That handed Ogier a golden chance to close the 23-point gap to Neuville in the title race, but the M-Sport Ford then suffered damage of its own on the following Datca stage. Ogier completed the stage with his car’s right-front wheel wobbling around, and parked immediately after the finish to attempt repairs. Autosport understands the breakage is on either a suspension arm, wishbone or toe link. Spares of all three are carried in the car and the time gap before Ogier is due at the next stage should be sufficient for a fix to be completed if there are no additional complications. Team-mate Elfyn Evans, known to be one of the most proficient mechanics among the WRC drivers, and his co-driver Dan Barritt have parked next to Ogier to offer advice, as has sometime M-Sport driver Henning Solberg – present this weekend in a privately-entered R5 Skoda. Under the regulations, the other drivers are allowed to advise Ogier and Ingrassia but not physically assist. Once the car is moving again, Ogier has to complete a 21-mile road section to the next stage. He would pick up a 10-second penalty for every minute he is late if he cannot make it for his allotted time. Ogier still leads the rally, as the SS9 damage occurred close enough to the finish that he only lost 18s. But Neuville’s team-mate Andreas Mikkelsen is now within 7.5s of Ogier again. Ogier and Neuville’s problem are potentially a huge boost for outside title contender Ott Tanak. 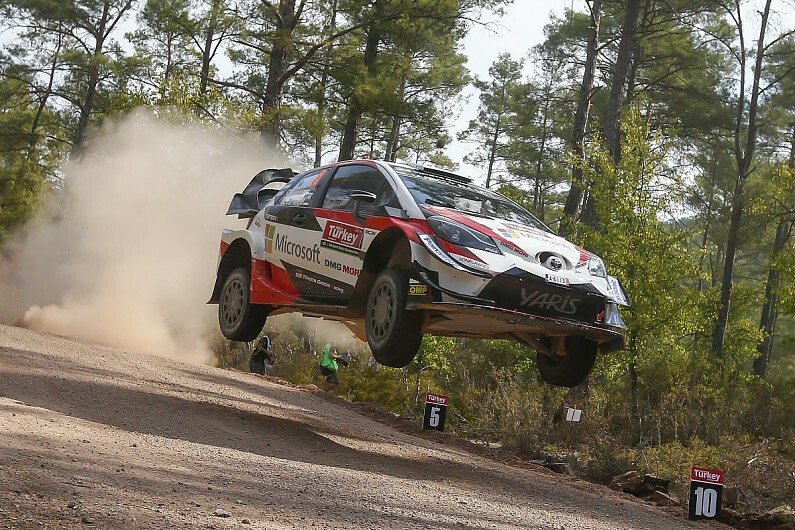 The winner of the last two rounds has struggled so far in Turkey, with his Toyota team off the pace, but is now up to fourth place and just 6s behind team-mate Jari-Matti Latvala ahead. Tanak went into this weekend 36 points behind championship leader Neuville and 13 off Ogier.